• Set of 1 folded scratch off note cards. • Note cards are 4.25" x 5.5"
• Cards are printed on matte card stock to allow for writing with a pen. 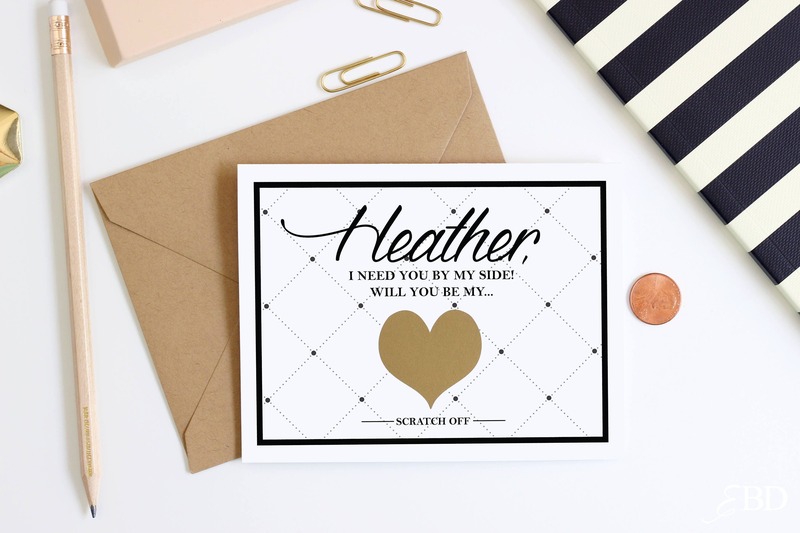 • The inside of the note card will also be blank to allow for a personal handwritten message. • Scratch off stickers come applied to the cards. • Note cards will come with 1-A2 Kraft envelopes. Please make sure to scratch off the sticker firmly with a coin. I can adjust the text to fit your needs. The graphics and layout come as pictured. I can add simple phrases under the scratch off such as..."bridesmaid, maid of honor, matron of honor, flower girl, ECT." Please leave your custom instructions at checkout. Choose your scratch off sticker color via the drop down menu. I will send a proof within 24 hours via Etsy. Please view our "Custom and personalized orders" section in our frequently asked questions for additional information and policy's regarding custom products.